AJGpr client, Nika Eshetu, owner/founder of Atomic Pilates in NoHo, California is an expert Pilates and golf fitness specialist. Recently, Lori Corbin, fitness reporter for KABC stopped by Atomic Pilates to check out Nika’s golf fitness program. Lori was so impressed, she featured Nika and the Atomic Pilates in this segment on KABC evening news. What looks like a typical Pilates session is actually a golf workout. “You’re bending your body in a weird shape that’s not natural – not good for your back. And in order to hit the ball hard and accurately, you need to torque and turn your body,” said Mitch Dunitz, of Sherman Oaks. Dunitz loves to play golf and does what it takes to improve his game, along with strengthening his body. Nika Eshetu owns Atomic Pilates and is also a Titlist Performance Institute golf instructor. She sees a growing number of golfers add this component to help their game. As most have this issues with their core and glutes. “Weak glutes, weak core are the biggest two because they work together,” Eshetu said. LASplash.com editor Stephan Martin came to Atomic Pilates twice to workout with AJGpr client Nika Eshetu, Master Pilates and Sports Fitness instructor. Here’s what he said in his article Atomic Pilates and Fitness – The Workout That Your Body Needs. Pilates and golf might seem like worlds apart, but that is where Nika Eshetu and her Atomic Pilates and Fitness come in to play. Nika has perfected both worlds and can put you through a workout like you have never experienced with her Pilates class. She can also use her expertise in golf to have your body perfectly aligned on every swing. Atomic Pilates and Fitness, located in North Hollywood, is far more than Pilates and Nika is far more than a Pilates instructor. Nika is the instructor who never stops learning and thus you are the beneficiary. The list of what she has knowledge of is always growing and includes; Pilates Method Alliance (PMA) Certified Instructor as well as a Master Instructor for the Evidence Based Fitness Academy (EBFA). Additional certifications include: National Academy of Sports Medicine (NASM) Certified Personal Trainer, Functional Movement Taping (FMT) 1 and 2 as well as her expertise in golf. Those are a lot of names that might not mean a lot to you, but needless to say if you visit Atomic Pilates, there isn’t much that Nika couldn’t help you with, but it all begins with Pilates. Atomic Pilates is the Pilates studio for everyone. From the beginner to the person who has been doing Pilates for years, Nika has a class for you and the equipment to challenge you as well. 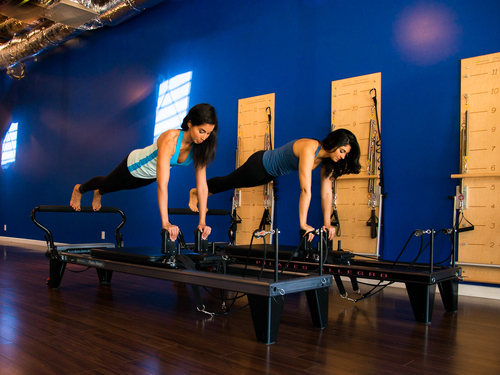 If you are looking to improve your core, posture, flexibility, and endurance, Pilates is for you. Pilates is truly something you have to try to get a true understanding of what it is all about. It will challenge you by working muscles you thought were working, but really weren’t. The workout will leave your body feeling sore, in a new way. But it will also open up your eyes to a new way of exercising and Nika and her staff always make sure that you are using proper technique and getting the most out of every class. In addition to Pilates, Atomic offers Bodhi Suspension classes. These are ropes that offer you multiple points of suspension. Most suspension systems out there are only two points of suspension. With the Bodhi Suspension System you can have up to four points of suspension. What this means for your workout is that you will have the benefit of being challenged by gravity in more variations and ways that your body has never encountered. Two points can be a workout, four is almost a work of art and will seemingly work every muscle in your body. Again, this is a workout that is different than anything you have ever done before. A great way to get introduced to Nika and to see how prepared you are to take her classes, the movement screening is an amazing start. Nika measures your range of motion in a wide variety of areas as well as some other tests to see where you are at physically and what you might improve in. With this test and her knowledge, Nika has a great ability to point you in the right direction and provide you with tips to improve. She can also tape you as you walk and tell you if you are walking correctly and how you can improve in that area. This test alone is worth a visit to Atomic. If you continue with Nika, you can retest down the road and see how you have improved. “That is why I started doing the screenings and assessments, once they see it in something measurable, then they can say wait things are really changing,” Nika said. While fitness has become more prevalent in golf, who knew Pilates could be the secret to fixing your golf swing? I would venture not many golfers, but the real key to fixing your golf swing is Nika. While an amazing Pilates instructor, she also is a Titleist Performance Institute Certified Fitness Professional as well as being K-Vest Certified. What does all of that mean? It means even though she isn’t a golfer, she knows more about how to correct a golf swing than almost any golfer out there. Nika gets you set up in a K-Vest so that your swing is recorded and then she can look at how your body as well as your hands are moving throughout your entire swing motion. This allows her to see if your posture is off or there are any adjustments that need to be made in your stance. Once she has you perfectly aligned, then you can test out your new stance and new swing and you will find out if you are doing it correctly. Posture is not only important in Pilates as well as any form of exercise and of course golf, but it impacts people in everyday life. “Now we are starting with kids in elementary school with these heavy backpacks, then reinforced with cell phones and iPad, so they are starting younger and they get older it just gets worse, I see people in their 20’s and 30’s hunched over, that shouldn’t be so, Pilates can make a huge difference,” Nika said. There are so many reasons to visit Atomic Pilates and Fitness, but the main two are for your own well-being and for Nika. While an amazing instructor, you will always leave a class or session not only feeling a little better but you will always leave with some extra knowledge that will help whether you are simply walking or sitting at your desk and you will feel better for it. Yesterday, PeopleStyleWatch.com, published a story on Miley Cyrus’s style choices and interviewed AJGpr client, the Queeen of Pilates, Mari Winsor about her contributions to Miley’s fab abs and long, lean leg as her personal Pilates trainer. Regardless of our thoughts on Miley Cyrus‘s sartorial choices these days there’s no denying that she’s gotten herself into amazing shape in order to wear the, shall we say, often skimpy getups she now favors. So while we’re not sure we ourselves would wear a pink satin bra and mini with creepers to our own album release party (and this is the tamer of the two outfits she wore) we are interested in how one would shape up to look that good in that outfit. Sign up for Mari Winsor’s newsletter at the bottom of her winsorfit home page here. On Thursday, September 5, 2013, Well & Good NYC, published an interview with AJGpr client, Mari Winsor — lovingly known as the Queen of Pilates entitled Mari Winsor: How Pilates Keeps Her Young at 63. Mari currently owns two studios in Southern California — West Hollywood and Santa Monica where clients work with top trainers privately, semi-privately and in group mat classes. Below is the Well & Good NYC interview with journalist Lisa Elaine Held. Famed Los Angeles instructor Mari Winsor is part of the Pilates vanguard. And at 63, she continues to expand her fitness empire, with celebrity clients (like Miley Cyrus—Winsor’s responsible for her abs, but not for that dance), and a new DVD out this week. That’s true even for healthy people—particularly as they get older. We asked Winsor to dish on how she stays fit, healthy, and happy as she ages—and for her advice on how those who haven’t (yet) dedicated their lives to fitness can follow her. How long have you been doing Pilates? I feel like my whole life. I was a dancer for 20 years, and I had a nice dance career. I danced with Michael Jackson and did some movies. As time wore on, you go, “Well, hmm, I’m not going to be able to do this forever.” That’s when my friend who was the lead dancer for the Ailey company suggested I try Pilates. I found a place, and then along came Romana Kryzanowska (Joseph Pilates’ protege). I went and had one lesson with her when she visited LA, and I was like “Okay, this is it. This is what I need to learn.” I glued myself to her side. At 63, you look incredible. I’m sure people must tell you that all of the time. Is it the Pilates? What’s your daily fitness routine like? I practice Pilates six days a week, and I also walk, and I do ballet class a couple times a week. For me, Pilates works from the inside out. You’re building flexibility and strength at the same time and strengthening your core, which is essential to holding on to good posture as you get older. But no matter what kind of workout you do, as long as you’re happy with it, you’re going to look and feel younger if you keep doing it. If you enjoy what you’re doing, no matter how many wrinkles you have, that youthful energy shines through. That’s great advice. What about for people who are finding it challenging to work out as they age? Do you have tips for them? It’s a day-to-day challenge; it’s not easy. Sometimes you kind of have to force yourself to move around a little bit, even if it’s just talking a walk, doing some deep breathing. You want 20 minutes of constant motion. They say aerobically you need to have 20 minutes of constant movement to get benefits. With Pilates, you are in constant motion from the beginning to the end if you do it properly. Is there anything else that’s not related to fitness that you think helps you feel and look great as you age? I think that beauty comes from within. If you’re at peace with yourself, and you’re a happy person, and you’re kind and have ethics, that shows. That glows through. For more information, visit www.winsorfit.com or check out Pink Ribbon Pilates. When does a recurring sore throat require a drastic treatment? AJGpr client, Dr. Nina Shapiro, the Director of Pediatric Otolaryngology and an Associate Professor at the David Geffen School of Medicine at UCLA was a guest on The Doctors to discuss if and when parents should consider scheduling a tonsillectomy for their child. Watch this clip, where Dr. Shapiro demonstrates the older versus newer techniques for removing tonsils on The Doctors. Workout Like A Star: Mari Winsor Shares Fitness Secrets. It’s a New Year – New You! Everyone wants to get in shape and Reuters TV turned to AJGpr client, fitness expert — “Queen of Pilates” — Mari Winsor. Mari Winsor, one of Hollywood’s most popular Pilates trainers is widely credited with popularizing this once-obscure workout and making it accessible to the public at-large. With the record-breaking and unparalleled success of Mari’s workout series and award-winning infomercials, Winsor Pilates became a household name. Thirty Pilates videos and over 50 million programs sold, later Mari’s groundbreaking dynamic workouts continue to help and inspire people across the country to take care of themselves, look better, live longer, and lead healthy satisfied lives. Today, fans of Pilates can join Mari’s “WINSORFIT CLUB.” For $10 a month, you can work out like a celebrity, in the comfort of your own home. Winsor Pilates comes to you! This first week trial is ONLY $1. No one does The Hundred quite like Mari Winsor. Of course, she also does a mean Rolling Like a Ball. If this means nothing then you’re not versed in the ways of Pilates. Mari has trained all the Hollywood A-listers and did so in the days when Pilates just sounded like some sort of dish at a fancy restaurant. The breathing-stretching-deep-core workout is actually one of the ways most Hollywood A-listers stay so toned. Now, you can do the same sort of routines at home with Mari’s newest DVD, Lower Body Pilates, which will be released March 6 and can be found on Amazon.com and ShopGaiam.com. SGS: What are the challenges for women over 40 when it comes to fitness? SGS: What is the appeal of Pilates for us over 40s? SGS: Do you need to be toned and flexible to start? SGS: Why are the lower abs so hard to tone? MW: “Lower abs are part of your Pilates powerhouse! They very important to use for balance, stability and movement. Many exercise regimes focus on external movement, which makes it more difficult to get those hard to reach areas. We focus in Pilates with every movement being initiated from your powerhouse. This will strengthen and tone your tummy everywhere faster than doing 300 crunches every day. SGS: Can you also give us some tips for arm fat…we hate it! MW: Light weights or resistance for the arms will help with unwanted fat. Diet, however, plays a major role in getting rid of unwanted fat. Cut out sugar and eat less of the starches and eat smaller meals. Stay away from carbonated drinks and stay hydrated!. SGS: What are your favorite 3-4 Pilates positions for over 40 ladies? SGS: What are your favorite diet tips? SGS: What do you eat during an average day? SGS: What else do you do to stay fit besides Pilates? MW: “I love to walk and I take at least three ballet classes a week. Of course, I do Pilates workout every day! SGS: Switching over to style, what are your favorite skincare tips? SGS: Can we throw in a hair care tip? Fitness expert Mari Winsor lovingly known as the “Queen of Pilates,” announces the launch of WinsorFitClub.com, an online fitness program that allows members to workout anytime, anywhere just by logging onto www.winsorfitclub.com. At the low cost of $15 per month, WFC members have access to at-home instruction with Mari and her team of expert Pilates trainers. For more details about the launch click here. Read what Pilates Expert Mari Winsor has to say about working your core (the Powerhouse) as part of your fitness routine in an interview with the Edmington Sun.